“For those of you who believe in romance [pause] and would like to continue to be fooled [pause], you may want to leave now.” I said this from just in front of my chair to appear a little casual before I was to take center stage. I completely expected a laugh at the second pause, but got none. I did not expect a laugh after the entire sentence, but got one. See, we’ve been writing, workshopping, rewriting and rehearsing these pieces so much that I’ve forgotten what was funny when I originally wrote it. That is the disadvantage of being this prepared. I just had to trust Past Dustin’s writing and hope that Present Dustin’s delivery of now numbed material with the help of rehearsed stage directions would do the writing justice. We had spent the last month and a half telling our stories to two equally numbed people with clipboards. It was refreshing to get a laugh, even though it didn’t come when I thought it would. But I’ve seen that happen on occasion before in my stand-up world so I wasn’t so thrown I wet myself or anything. As I said before, this was the thesis of the show so I did not want to forget my lines or botch the delivery. It probably made it a little more stiff, but that also played to the content. There is a concept in art called “formalism,” which is really the only thing I remember from 5 years of film school. It is defined as “the marriage of form and content.” So if you’re shooting a violent scene, choppy camera action and quick cuts are valuable, whereas you may want to handle a love scene with soft lighting and a steady tri-pod (no pun intended). So my calculated movements probably played to the mathematics inherent in the piece anyway. 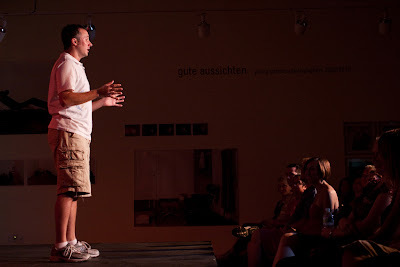 This was in direct contrast, however, to my urge to start the show with energy as I’ve learned from my stand-up days. If you get a crowd on your side early, you get a lot more leeway with longer set-ups and they’ll give you the benefit of the doubt with a later joke or two as they already like YOU. But here, it was my job to set up the thesis, almost in lecture format. It wasn’t without laughter, but it was uncomfortable as I’m used to trying to make laughter happen every 15 seconds. Because of this, I probably rushed it a lot more than I should have. By the last couple performances, I started to play with the concept of silence in certain parts. A fellow comedian once told me to use silence almost like a business contract signing with the audience, where the first one to talk loses. Just wait for the laughs and demand them. It’s worked before but it was risky here. There is a part in my opening speech where I talk about being compatible with a relationship partner. “There are areas of high importance. Religion… willingness to have children… willingness to perform certain sexual acts.” I would pick out an attractive girl in the first two rows – one the rest of the crowd could see – and stare at her during “perform certain sexual acts,” while changing my voice from lecture to cheesy lounge singer and summoning up a horribly pathetic eyebrow-flickering smirk on my face. I found that the longer I waited after the end of that phrase, the more laughs I would get when I snapped back out of it. “Then there are areas of less importance. Preferred hair color… room temperature… the willingness to perform… other… sexual acts.” This was even longer and cheesier and I would go back to the same girl. It went over at least serviceably well each time, but I think I had honed that craft by my last performance, though the girl I picked out could not have been more uncomfortable. That sucked, but this wasn’t necessarily about her anyway. The crowd just needs to see me hitting on the same girl twice (three times as I will do it almost an hour later). Sorry, blond girl in the front row from Sunday’s show in case you’re reading this. The same thing happened to the girl Molly had to hit on in one of the performances. Oh well. We’re both taken anyway. My first piece is broken up into two parts, separated by Jenn’s “Perfect Kiss” piece, which is supposed to serve as a sharp contrast to my “Statistical Probability Model” piece. The first part has a lot of numbers to remember, but like I said, I had done it to death and knew the numbers well enough to hit them all perfectly in all 5 shows. Where I struggled was with the delivery of such dated material. I had 5 shows to play with and got better and also never sucked, but I strived for the best reaction I could get each time. I specifically had trouble perfecting my line about deal-breakers “no smokers… no diseases… no fatties… no republicans, etc.” I never got my footing on the negative space there. Also, I know – I really do – that this is more analytical and satirical than it is funny, but I can’t help but try to do everything I can to use my facial expressions to make the material as funny as it can be. So I had to go back to my seat frustrated every time and just trust in the concept. Which, as I’ve already mentioned more than once, worked to perfection.